The Chandra Deep Field South, observed in the U-, B-, and R-bands with ESO''s VIMOS and WFI instruments. 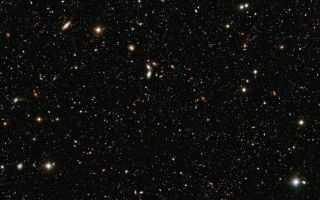 The Chandra Deep Field South, observed in the U-, B-, and R-bands with ESO''s VIMOS and WFI instruments is seen in this space wallpaper. The U-band VIMOS observations were made over a period of 40 hours and constitute the deepest image ever taken from the ground in the U-band. The image covers a region of 14.1 x 21.6 arcminutes on the sky and shows galaxies that are 1 billion times fainter than can be seen by the unaided eye. The VIMOS R-band image was assembled by the ESO/GOODS team from archival data, while the WFI B-band image was produced by the GABODS team.